I am a lip gloss junkie…I love the look of a glossy lip and find it much more youthful and flattering than a matte lip (see this article HERE). 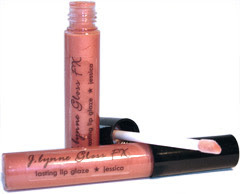 My new favorite is the Gloss FX lip glaze by J. Lynne Cosmetics. The newest addition in her line of mineral makeup---the lip glosses are pigmented with micas to create a palette of colors that ranges from sheer to dramatic. I got the Chloe (gorgeous neutral pink with hints of mauve and plum) and the Jessica (brownish-pink, gorgeous!) and they are fantastic on their own (as a more subtle wash of color) or over your regular lip color for extra shine. The best part of the glosses…they are all natural (Avocado Oil, Sweet Almond Oil, Vitamin E, and Lanolin are some of the ingredients), ultra moisturizing, super shiny, and have a delicious hint of orange flavor. Only $12, and there are some great holiday specials going on over there right now too!! Ooooh! I love lipgloss too. I swear everytime I am out and about, I always find a new tube to bring home! These look great! And you can't beat that price!